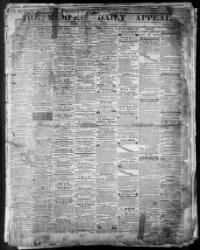 A big thank you and a heartfelt congratulations go out to Joyce McKibben on the launch of the Index to the Civil War in Memphis Newspapers 1860-1866. The database focuses primarily on local and regional events but includes coverage of events throughout the United States and the Confederate States during the Civil War. Coverage includes the following papers: Memphis Appeal, Memphis Argus, Memphis Avalanche and the Memphis Bulletin. This database joins the Index to the Memphis Appeal and the Index to the Obituaries of the Memphis Appeal to allow unprecedented accessibility to early Memphis history.